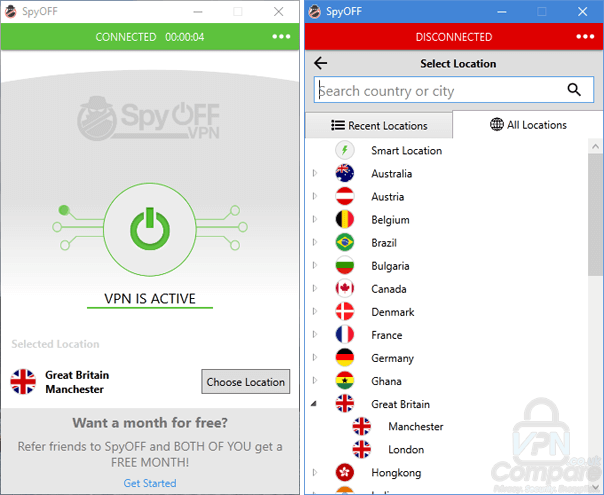 SpyOFF VPN is a young VPN provider with a strong offering, but still some areas for improvement. Like their apps, the impression you get is of something pretty decent, but there is a lingering sense that you still want more. SpyOFF VPN is a new VPN in what is already a crowded marketplace and the pressure to compete is intense. In that cut-throat environment, they have put together a decent offering, with neat apps, decent speeds, and unlimited connections. But there is still a sense that something is missing and one or two more prominent issues that need addressing too. What SpyOFF have done is throw in an extra four months for free with every twelve-month subscription. That means you are paying the equivalent of just £4.70 a month for the duration of the contract. That is a reasonable price, but otherwise, all of these rates are on the high side. SpyOFF also offers a 30-day money-back guarantee. That is available on every package and means you have plenty of time to try their service out before committing any money to them. You can pay using all major credit cards and also PayPal too. For really privacy-conscious users, there is also the option to use BitPay which is a welcome addition. You should, however, be aware that if you don’t cancel your contract within seven days of it ending, it will automatically extend by another twelve months at a rate of £6.26 a month, which is their standard annual subscription rate without the special offer added on. SpyOFF VPN offers its service via either OpenVPN, L2TP/IPsec, and PPTP protocols. Which one you connect to depends on which of their three connection settings you opt for. All settings work well enough but we would advise all users who are concerned about privacy or online security to opt for OpenVPN and so ensure that they are using the best encryption level possible. The good news is that SpyOFF VPN has a policy of keeping absolutely no user traffic logs. This means that there is no record of what you get up to online. They do keep some user data on file such as your name and method of payment which, at the moment, has to be a credit card. But while this is not ideal, it does still mean that your online activity will remain private and is standard across the industry. Despite being a reasonably new VPN, SpyOFF VPN is already offering its users a pretty substantial server network. At the time of writing, they have 1,007 servers available in 40 different countries around the world. This is an impressive network for any VPN, never mind one so young. It is a diverse network too, with servers across Europe, North and South America and Asia and all the most popular locations accounted for. Most VPNs these days have a limit of five connections for every subscription. A few have stretched this to seven and the odd one has gone as far as ten. But SpyOFF VPN has taken matters even further. If you sign up for SpyOFF VPN, you can connect an unlimited number of devices to their network at no extra charge. It is a nice feature and one their users certainly appreciate. In the Internet-of-Things age in which we find ourselves, SpyOFF VPN could be setting a trend which many other providers will follow. Aside from the usual, there are not a great many additional bells and whistles. There is a Kill Switch, which is increasingly essential in all VPNs these days and ensures your IP Address won’t leak if the VPN connection goes down. You can also configure the app to open automatically when you switch your device on, which is also quite a neat little touch. Finally, on the SpyOFF VPN website, they have also provided a DNS leak test, a WebRTC leak test and the rarely offered Warrant Canary. Three features we wish most services would offer but often don’t. The SpyOFF VPN apps rather reflect their overall service in that there is nothing inherently wrong with them, but also nothing to get too excited about either. All of their apps are pretty much identical and all have a clean and simple design with a grey background and either a red or green colour scheme depending on whether or not you are connected. They are relatively easy to use, with the connect button and choose locations button both prominent on the front of the apps. The settings and other options are a little less easy to navigate, but none but the most novice of users should have too many problems. In some ways, the SpyOFF VPN apps can feel a little retro and dated. There are undoubtedly other providers with far more impressive offerings. But there is nothing majorly wrong with their apps either. They do the job, but they don’t exactly inspire. SpyOff offers many encryption protocols from OpenVPN with the highest encryption which should also, in theory, give the lowest speed. All the way through to the insecure PPTP protocol and with its lowest encryption should yield the fastest speeds. Anyone who’s interested in online privacy will always select OpenVPN, so that’s how we’ve been testing their service. General everyday internet usage was no issue, from browsing websites to streaming movies. We saw no problems with the SpyOff servers in terms of speed. To push the service to its limits we carried out some speed tests. Using a Windows computer on a UK residential internet connection, we downloaded a test file. Our standard connection speed was 63.12 Mbps. The following are the results when connected to a selection of SpyOff’s servers at random. Overall speeds are relatively good and across the board, they compete with many other VPN services. *We initially couldn’t connect to the Swedish server at the time of testing but upon testing a day later connected without issue. The UK – London server presented issues when connecting but an email to SpyOff’s support got the problem resolved quickly. In its place, we tested their Manchester server. As we have said already, your choice of connection setting will dictate what encryption you end up using. SpyOFF VPN says all but the high-speed connection (PPTP) will offer 256-bit encryption which sounds terrific. OpenVPN connections use AES-256-GSM encryption. Handshaking uses a 2048-bit RSA which is comparative to other services although there are some which offer higher levels. The highest speed connection uses the PPTP protocol which is always 128-bit encryption. However, they fail to provide any more information beyond that, which we found a little troubling. 256-bit encryption is more than sufficient to keep your data secure in this day and age, but almost all VPNs publish a lot more information than that. If you’re a novice then you won’t want to complicate things but if you’re a little more clued up then it would be beneficial to have a bit more detail provided. As we have noted above, SpyOFF states clearly that it does not retain traffic logs for any of its users, which is excellent. They do however keep some details of their customers including credit card details. Retaining any data not ideal, but they are far from the only VPN provider to do so. Details of exactly what data this involves are sketchy but suffice to say it is not ideal. SpyOFF VPN’s registered location is San Marino, a small city-state in northern Italy. Not being versed in Italian, it has proved hard to find details of San Marino’s laws on data retention, so we cannot say for sure what laws SpyOFF is bound by in this regard. However, there are some areas on the law in San Marino which do require data to be held for one year, so it is possible this could apply to SpyOFF’s user data too. One of the standout features of the service is they have a Warrant Canary. A warrant canary, in theory, will alert you to any government actions against the service. While Warrant Canaries aren’t fool-proof, it’s nice to see this newcomer forward thinking in these areas. SpyOFF VPN is a young VPN, so deserve credit for how far they have come in such a short space of time. But while there is plenty to praise about their service, there are still several areas needing improvements. They have a decent-sized network server and offer apps for mobile devices and desktops which are neat and relatively easy to use without being spectacular. Their encryption appears to be good, although details are lacking and their connection speeds were decent too. A real highlight is the unlimited number of concurrent connections on offer, which is a great touch. Their privacy policies have room for improvement both in terms of clarity and the amount of information they appear to collect, although their no traffic logs claim appears sound. Prices are on the steep side too, especially given that more established VPNs with a stronger service cost less. SpyOFF has made a decent start and if you do choose to sign up with them, it seems unlikely you will have too many complaints. But you also probably won’t be shouting about them from the rooftops either and that lack of wow-factor is something they have to work on. Have you signed up for SpyOff? What did you think of their service? We would love to hear your thoughts so pop a note in our comments section below. 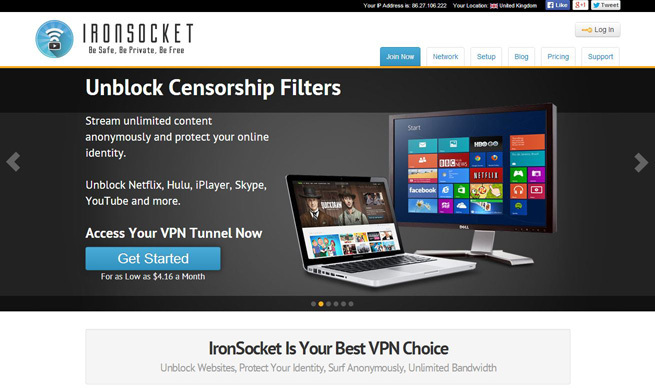 VPN.ac Review 2016: Hot or Not?